Flat rate S&H $10. Dropped shipped directly to you if not picking up from Tes or Dani. We want to help you protect your loved ones without being poisoned with toxins. This is a natural oil that evaporates into the air so depending on states and seasons you will need to apply accordingly. #1 best buy for the money! TI Tips & Notes: a) I use Vet's Choice dilution sprayed on myself when working in the parks (lasts longer then 4 hrs compared to the Dr. Ben's Paws & Claws); b) I spray Vet's Choice onto the spoos after a cedar oil shampoo, cream rinse, then slight drying, I then spray them all over with - 2oz. concentrate to one gallon water dilution - rubbing into skin with a massage effect. This provides extra protection and oils to their skin for up to 2 wks. Then I spray again protecting them every week to two wks depending on season ...read more below... c) In laundry wash place 1 oz into the fabric softener dispenser...this will help your clothes, or Royal Pet Beds to repel critters! VET'S CHOICE LAWN & KENNEL TREATMENT - No measuring or mixing with this easy to use “Chemical Free” spray. Simply hook up to your garden hose and start cleaning and killing bacteria, mildew and insect infested areas from Kennels, barns, stalls, dairy barns, dog runs and other large areas. LEAVES THE AREA SMELLING LIKE THE OUTDOOR TEXAS HILL COUNTRY. 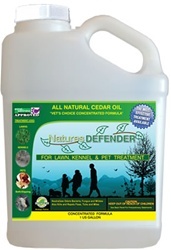 Also used to kill fleas, ticks and other un-welcome critters harboring in lawns. This product is used in and around barns and stables to repel mice, rats, heat seeking venomous snakes and scorpions. A safe 100% natural cedar oil solution. Best time to treat is early morning or evening. Do not treat in the middle of the day or whenever it is hot. Should treat approx. 4000 sq ft. For best results, lawn should be mowed a day or two before spraying. Spray using a slow, even sweeping motion, being sure to cover the entire lawn surface where the pets will normally frequent. Spray under ornamentals and trees, but avoid soaking young flowering plants. Treatment every 15 days in lawn will create a barrier of insect re-entry and break the egg layer cycle (Also see Cedar Granule Wood Product). Treat as often as necessary in kennels. Cedar Oil Vet's Choice 1 gal concentrate, with water makes up to 8 gallons! THIS IS A SUPER SAVINGS - NO expiration date to worry about - we use in every facet of our home year round: pets, laundry, furniture and more!!! VET'S CHOICE is a Cedar Oil formulation for the Animal Health Industry for treatment of burrowing insects, Burrowing Mange Mites and other skin issues common to Pets, Poultry, Dairy, Equine, Goats, Sheep, Llamas and all other domestic or exotic mammals. (DO NOT USE AROUND EXOTIC BIRDS OR PET ROTDENTS) VET'S CHOICE is approved for use on newborn offspring and the nursing mother. NOTE: The above two PRODUCTs ARE NOT A REPLACEMENT FOR DR. BEN'S PAWS & CLAWS - when hiking into heavily wooded areas, use Dr. Ben's Paws & Claws to quickly repel those critters! VET'S CHOICE can be diluted in ratios of 400:1 for Livestock Dipping Stations. VET'S CHOICE diluted solutions can be used in grooming of Dogs, Cats and other animals.(2oz. concentrate to one gallon water) Hand held or back pack sprayer use 4 oz. to 1 gallon water this formulation will make 8 Gallons in a hand held pump up sprayer. (each gallon will treat approx. 1000 square feet) When using our 20 gallon Hose end sprayer use 8 ounces concentrate, fill remaining bottle with warm water, hook up to hose and receive approximatley 20 gallons of treatment, this formulation will make 4 applications for use. Use A 50% CONCENTRATE TO 50% WATER MAKE A PASTE TO APPLY TO YOUR ANIMALS 3 TIMES DAILY. USE UNTIL YOU RECEIVE YOUR DESIRED RESULTS. For Cleaning areas like Kennels, barns, stalls, dairy barns, dog runs and other large areas use our 20 gallon hose end sprayer. ALSO LEAVES THE AREA SPRAYED SMELLING LIKE THE OUTDOOR HILL COUNTRY. Ideal for use on EXISTING wood bedding of farm animals, simply spray down pine and other wood shavings with this formula for the aroma of cedar oil, a natural insect repellent. This product can also be used as a treatment around your patio, lawn. DO NOT USE ON FLOWERS OR IN GARDENS ONLY GRASS. This product is used in and around barns and stables to repel mice, rats, heat seeking venomous snakes and numerous insects from areas treated with it. An alternative natural cedar oil solution to chemical applications. Treatment will create a barrier of insect re-entry and break the egg layer cycle. Best time to treat is early morning or evening. Do not treat in the middle of the day or whenever it is hot.